On the 15th of each month, Carol at May Dreams Gardens hosts Garden Bloggers' Bloom Day so we can all show off the flowers in our gardens. It's an excuse for lazy gardeners like me to keep better records of what's going on in the yard... and I must say that I'm kind of surprised at the dearth of flowers in my yard in August! I've also noticed that while the butterflies ignore the fennels and the asclepias that I've planted specifically for them, I will find the occasional monarch having breakfast on the ligularia. That's as good of a reason to let them bloom as any! That is my bolting 'Florence' fennel, shown against a backdrop of 'Rotstrahlbusch' switchgrass. 'Florence' is a bulb fennel, and if it doesn't get enough moisture it will bolt on you very quickly. I thought that I had been doing a good job of keeping it watered, but... apparently not! I'm going to have to try to save seed and start a few more of these for myself next year. 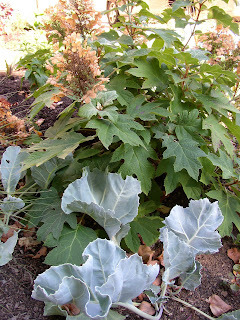 By and large, though, the front yard garden is more about foliage and texture than it is about blooms. (So much so that I'm working on a separate post about it.) 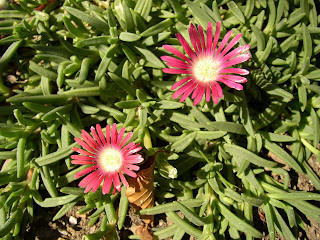 While I work on that, I'll sign off with a complete list of blooms in the garden for August 2008. Make sure to check out Carol's August Bloom Day post for links to what's growing and blooming in gardens around the world! Lovely! 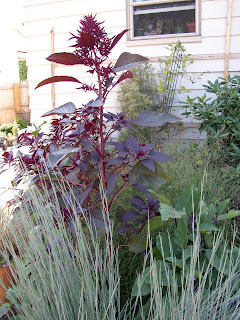 Thank you for identifying the tall red plant as amaranth! It is good looking. How is Ivory Prince hellebore in your garden? I just added him this past spring, it's always iffy for me to spring plant..it get dry and hot very fast here in Nashville! I grow bronze fennel and it seeds itself about everywhere...but you grow it, too, if I remember a few posts back? So far not one caterpillar or maybe the birds are too quick to capture them! Well thank you for letting me ghost post on your comments section;->sorry if I went on and on! I enjoyed all your blooms and the commentary that accompanied the photos! 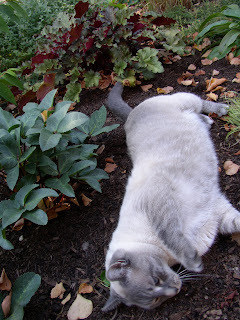 I love the kitty that naps in your garden! 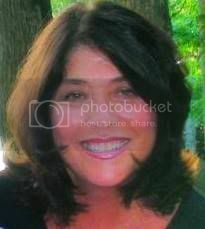 A "dearth of flowers," Kim? It doesn't appear that way, based on your photos and lists! 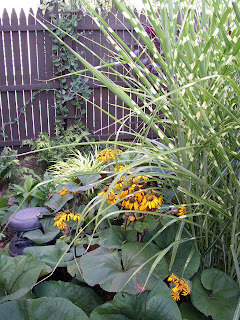 That little teucrium is very cute, and the ligularia/miscanthus combo is a beauty. I think my favorite is the kitty combo, though! I can imagine how lovely he would look with lamium. Oh, wait, I have another favorite: the fennel with the switch grass. I can understand why you'd be disappointed at missing your harvest, but it's a beautiful pairing. Your kitty bloom is a beaut. I like Othello too. I have invited him to my garden several times but he doesn't stick around very long. Your garden as a whole looks great. With all that color in the foilage who needs blooms??? You have a lot going on Kim - it looks great for August. The Swallowtails seem to like my green fennel - guess you can snip the leaves for seasoning but it doesn't make bulbs - has reseeded in a few places. Kim, at Pam/Digging you mentioned Totally Tempted cuphea - I have two other varieties of batface cuphea that have survived and bloomed, but like yours, my TT is Toast. 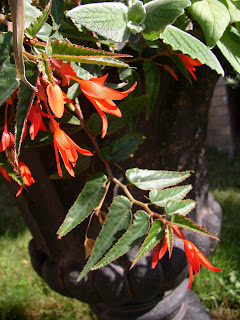 I love the Bonfire Begonia! ICQB, thanks for stopping by! I love that he naps in my garden, too, but it makes for interesting times when the dog discovers his presence... lol. Nan, it certainly feels like a dearth of flowers in comparison! 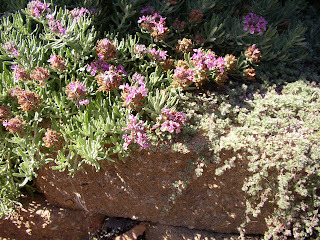 *smile* I love that little teucrium, and it's a nice step-up, height-wise, from the woolly thyme that otherwise cascades over those stones. The fennel/switchgrass combo is very nice, isn't it? 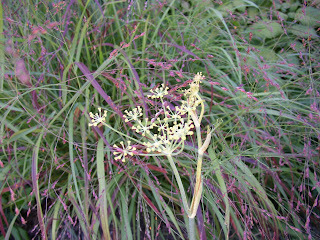 But, darn it, I have bronze fennel just behind the switchgrass, so I get to see that anyway. lol. Greenbow Lisa, I think that you mentioned that about Othello before... if I could figure out how to send you some of him (maybe next year when he's just breaking dormancy?) I would happily do so. I have a few more of 'Othello' than I really need, to be honest. Annie in Austin, thanks for weighing in on the Totally Tempted. Sorry to hear that it's now Totally Toast, but that makes me feel a lot better--I've been wondering what on earth I could've done to kill such a tough customer! Fern, thanks! So do I--definitely am using more 'Bonfire' next year! Though we all love flowers, foliage is really where it's at, right? I look forward to that post, but meanwhile your few blooms do look pretty. That amaranth is so much fun. Thanks for sharing your blooms again! Your garden always has great combos. On digging and dividing Surprise Lilies (Resurrection Lilies), I dug up the bulbs in mid-September last year and immediately replanted them in new locations. 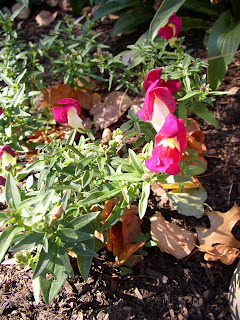 They did well, though there was one I didn't get deep enough and it heaved out of the ground during the winter, so be sure and plant them nice and deep. You should mark where the blooms are in your grandmother's garden now so you can find the bulbs later. 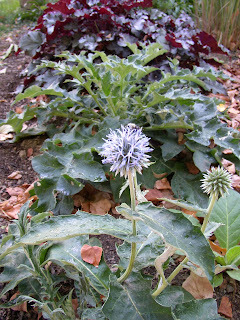 I've also successfully transplanted them in the spring, by digging up the foliage and bulb. Frances, yes, the foliage on 'Ivory Prince' is very nice. There are a few similar-foliaged ones that I've seen in the newest Plant Delights catalog, with names like h. ericsmithii and h. nigercors. The leaves are shorter, and darker green, some with white or silver overlays... I wonder if they seem to hold up better and look nicer because they're so short? In any case, it definitely can handle some dry conditions, based on where it is in my garden! My seedpods are still small, and showing no signs of change right at the moment. (But then, they don't look like they're dying or duds, either!) I'll have to send you a picture today to see what you think. I'm digging that begonia! Looks like something hummingbirds would enjoy...I need to find one next year. You had a really nice Bloom Day! Where's Coco? 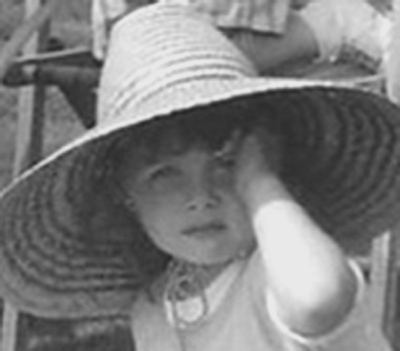 How could she let a CAT sleep her in garden? She must be losing it. I agree with your dislike of the color of the Ligularia blooms, but if the butterflies like them, who are we to argue? lisa, I think that I need to put up a hummingbird feeder next year. Between this, the pineapple sage, the native honeysuckle... the hummers really SHOULD like me, but they never seem to come around! Very good point about the butterflies and the ligularia. I guess I'll keep them! The flowers and plants are nice but that cat is stunning. I'd be tempted to keep it. I'm with MrBrownThumb. That cat is fabulous! I'd be feeding it and doing everything I could to entice it to stay in MY garden! Lovely goings-on in your garden, Kim, as usual. I'm glad to hear you say you had cut down the blooms on Ligularia, because the blooms on that are exactly why I've never purchased it. 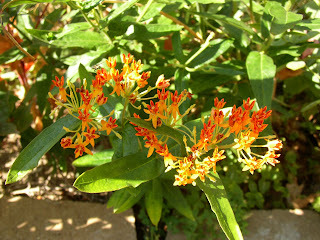 I love the leaves and for some dumb reason I've never thought that I could just cut the blooms off! Your Verbena bonariensis isn't blooming yet? Mine has been blooming for several weeks now. I winter sowed it last winter. I really love it! I'm finally visiting bloom day posts...better late than never? In any case..thanks for the info on watering bulbing fennel. I wonder if that explains my inability to get it to bulb up! 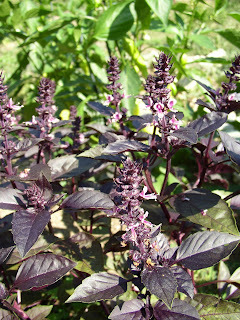 I hate to pinch back the purple basil too...the flowers are prettier so I am tempted to leave them too.